Application Mover is designed to move programs from one path to a different path on the same hard disk or to another hard disk on that same computer. The program works on specify paths (folders). For example, you can move: c:\prog\editor -> c:\oldstuff\edit or to a path on a different drive such d:\rare\editor. 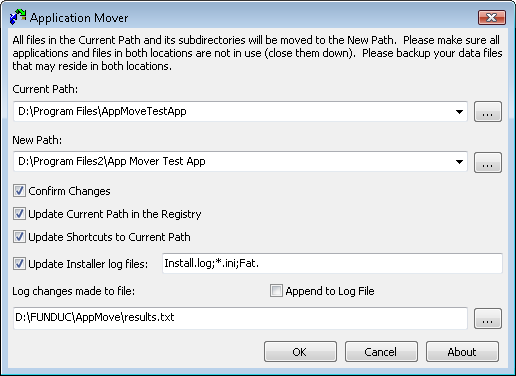 Application Mover is not intended to be a clone utility. Technical users can put the program to use in other ways but the standard functioning of Application Mover is that the physical drive arrangement & lettering should remain constant on your machine. Important Notes: Read through the 'Important Notes' topic (also in the program F1 documentation) for information about the program and usage suggestions. Application Mover must be run 'As Administrator' so you must allow the UAC (User Account Control) prompt when asked after launching the program. Application Mover is compatible with Vista, Windows 7, Windows 8, & Windows 10. 32-bit and 64-bit (x64) versions are available. You must use the 64-bit version on a 64-bit operating system. Use of the 32-bit version on a 64-bit operating system is NOT supported. SETUPAM.EXE (1.4 MB) - Self-installing version for 32-bit Windows. See Install & Uninstall Information for guidance about installation and removal. Download this to a temporary directory and run 'setupam.exe' to install. SETUPAM64.EXE (1.7 MB) - Self-installing version for 64-bit Windows. See Install & Uninstall Information for guidance about installation and removal. Download this to a temporary directory and run 'setupam64.exe' to install.